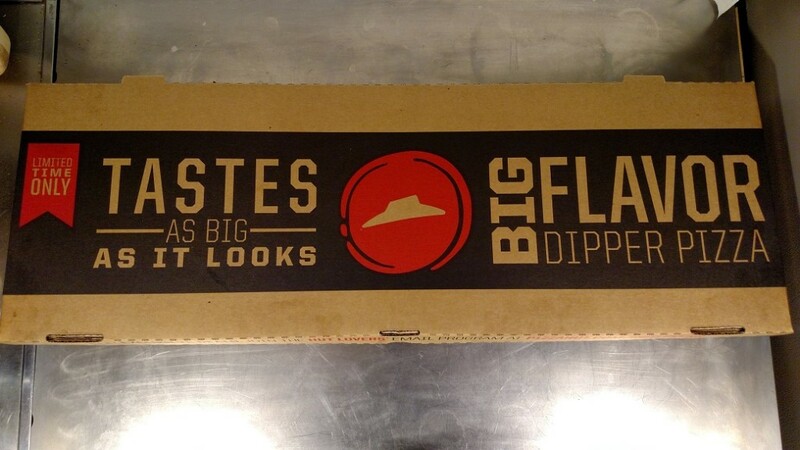 We saw an ad in the weekly coupon mailer for the new Big Flavor Dipper Pizza at Pizza Hut. Naturally, we had to try it right away. Pizza is what a Fewd Snob is all about, after all. 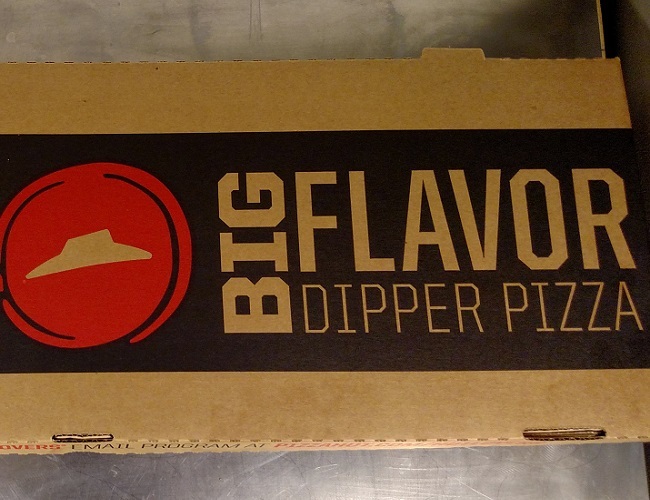 Pizza Hut is offering a deal where you can get a 1 topping Dipper Pizza with a free Pepsi products 2-liter if you order online for $12.99. 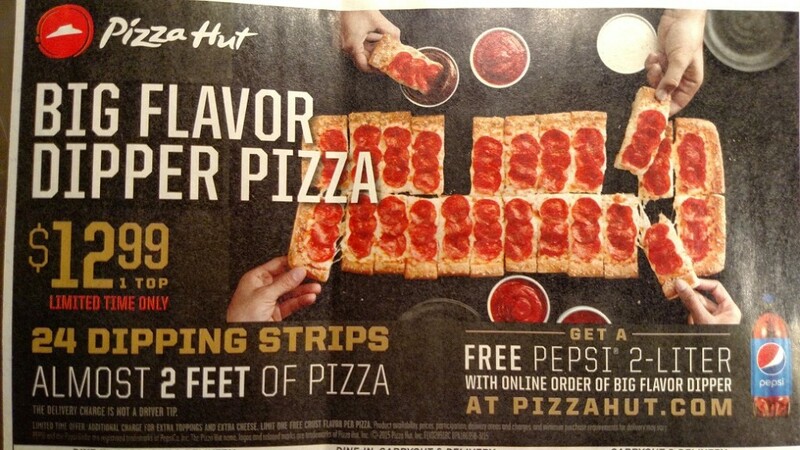 Pizza Hut advertises that the pizza is almost 2 feet. It is cut into 24 strips. All of this sounded good to us, so off to pizzahut.com we went. We ordered ours with half pepperoni and half Italian sausage. The cool thing with this is that we weren’t charged extra for the half and half. Some places do charge extra, or charge for two toppings. This is a surefire way to piss off the Fewd Snobs. So we were off to a good start. There are the typical customization options available for this pizza. For example, you can add crust flavorings for free. Denny is vehemently against crust flavors, so we ordered it standard. You can also add more toppings for an additional charge. The real point of this pizza is to dip it into the sauces that are available. There are two sauce set options. 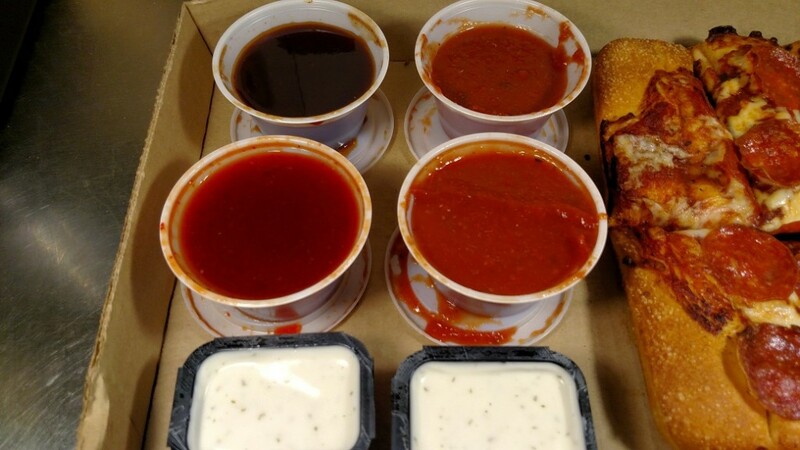 The “Explore Sauce Set” has 2 Marinara, 1 Ranch (which for us came as two pre-packaged Ranch cups), 1 Honey Sriracha, and 1 Barbeque. The “Classic Sauce Set” comes with 4 Marinara sauce cups. We opted for the “Explore” set, because that sounded more adventurous. The website said we had 15 minutes to pick it up. It wasn’t quite ready when we got there. We didn’t mind, because it was fresh out of the oven. The first thing to note is that the woman who brought the pizza out to us couldn’t figure out how to close the box. She just kind of jammed it shut. The cardboard got bent, and kind of came open on the drive home. Also note, the box is huge. It would NOT fit in most fridges, should you have leftover. The first thing to note, right off the bat, is the cut. The ad shows 24 evenly cut pieces with 3 pepperoni slices per piece. You will clearly notice the discrepancy above. The end slices were essentially just crust. They were not cut well, so it is hard to tell in the picture that the end pieces are actually cut at all. There are certainly NOT 3 pepperonis per slice. There are a couple of slices that are VERY small and narrow. Pizza Hut was more generous with the Italian sausage than the pepperoni. The pizza is essentially the Pizza Hut Pan Pizza. The crust is identical. The Pan crust option used to be very greasy, but doesn’t seem to be as much lately. This pizza was not very greasy, which is a good thing. The pizza does suffer from the typical Pizza Hut problems, however. First, there just isn’t enough cheese. This is the case all the time with Pizza Hut though. The sauce was not evenly spread on our test pie at all. Some slices had huge globs of sauce, while others were sparse. The crust was very good. It wasn’t burned at all. It was evenly cooked, chewy, and had a great flavor. The nice thing about this pizza compared the regular pies is that you get more crust with each piece. The pepperoni is very good. Not too strong, but just a little zip. 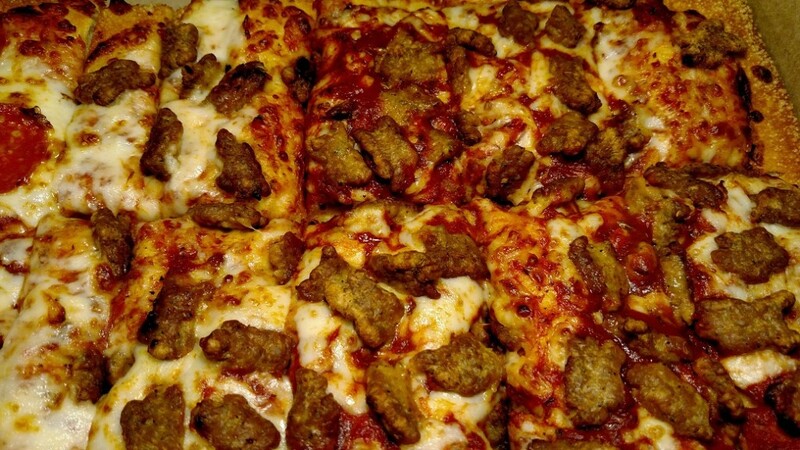 The Italian sausage is good for typical pizza chain Italian sausage, and there was plenty of it. Italian sausage that the national pizza chains use is not like real Italian sausage, but it will do since it is the only option. Overall, the pizza itself is basically a reshaped Pizza Hut Pan Pizza. The real point of this pizza is the dipping sauce. Marinara Sauce: The marinara is Pizza Hut’s standard marinara sauce. It is the same as what comes with the breadsticks. The sauce is pretty basic and standard. It has a good tomato flavor. It is not sweet. It has just enough seasoning to give it a good flavor. 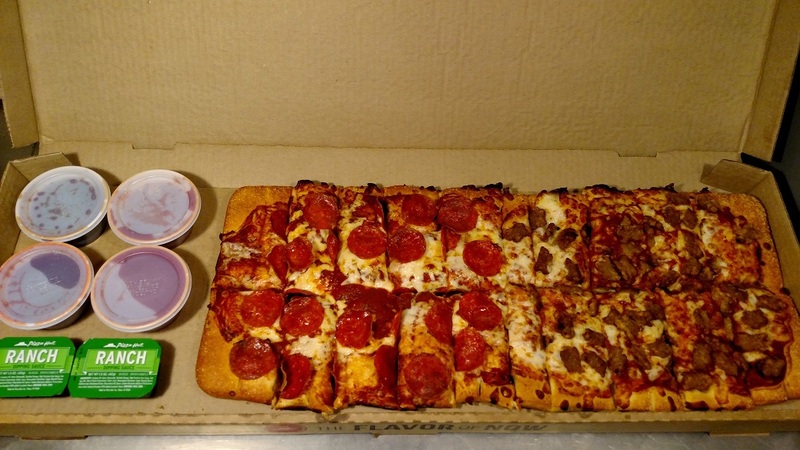 Nothing Earth-shattering, but it is great for dipping with this pizza. Ranch: What can we say? It is Ranch. Honey Sriracha: You may remember from our Fewd Fight, Denny and Herman completely disagree on Sriracha. That said, even Denny liked this sauce. The honey added to the Sriracha gives this sauce an interesting twist. You taste just a hint of sweet, and then a good amount of heat follows. The flavor is definitely different than regular Sriracha sauce. It is PERFECT. The sauce doesn’t overpower the pizza. In fact, both flavors are there and distinctive. The flavors blend perfectly. The Fewd Snobs agree that this is their favorite of all the sauces. Barbeque: This was the biggest disappointment of the entire deal. We have a hard time even calling this barbeque sauce. It is overly sweet. WAY too sweet. It isn’t billed as honey barbeque, and yet sweet is the dominant flavor. Herman thinks it tastes like liquid smoke. Fake, nasty liquid smoke. Denny doesn’t really taste the liquid smoke, but he sure doesn’t taste barbeque either. We don’t know what this is, but it was terrible. If we could do it again, we would ask to see if we could get two Sriracha sauces and skip the barbeque altogether. The really cool thing about it all is that there was PLENTY of sauce. We used a generous amount, and still had a ton leftover. 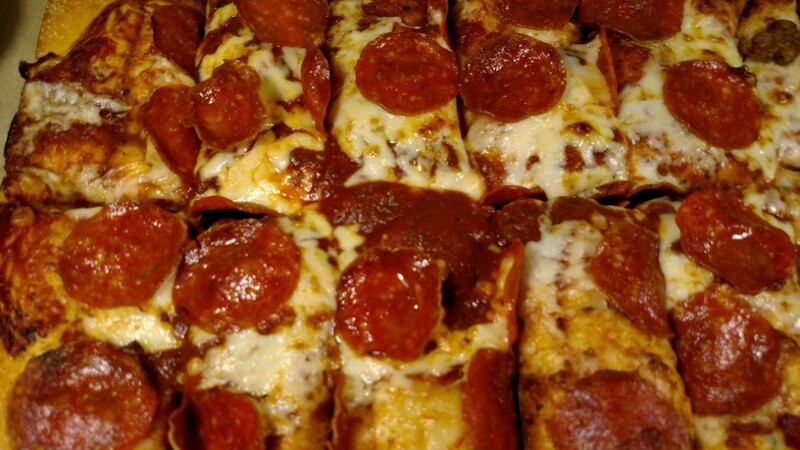 Even if you doused the pizza in the sauce, we think you’d have a hard time using it all. This brings us to the best thing of all. This pizza is a great value. The Fewd Snobs and a friend all ate on it. Since this was a test, we ate lunch portions. There was still a little leftover. We think this pizza would feed 3 typical guys for lunch, or 2 typical guys for dinner. It would probably feed 20 women for lunch, and 15 for dinner! Sorry ladies, couldn’t resist! There is a LOT of food and sauce here for 13 bucks. Another perk is the free 2-liter if ordered online. This just adds to the value. Is this the greatest pizza ever? No. But we didn’t expect that. It’s Pizza Hut. It’s good. Would we get it again? Yes, definitely.